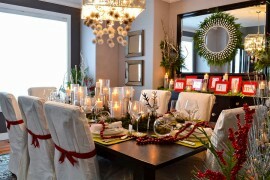 It is that time of the year when red and green seem bountiful when it comes to home decorating. But why not embrace refreshing green well beyond Christmas and the holiday season? 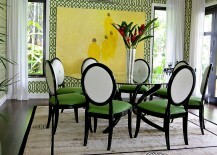 Green is a color that can be used both as a relaxing or exciting hue thanks to its many shades, hues and tones. 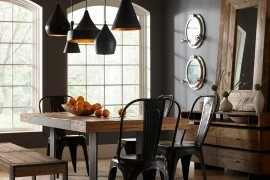 And the dining room is one of the best places to try out this color before you take it to other rooms of the house. 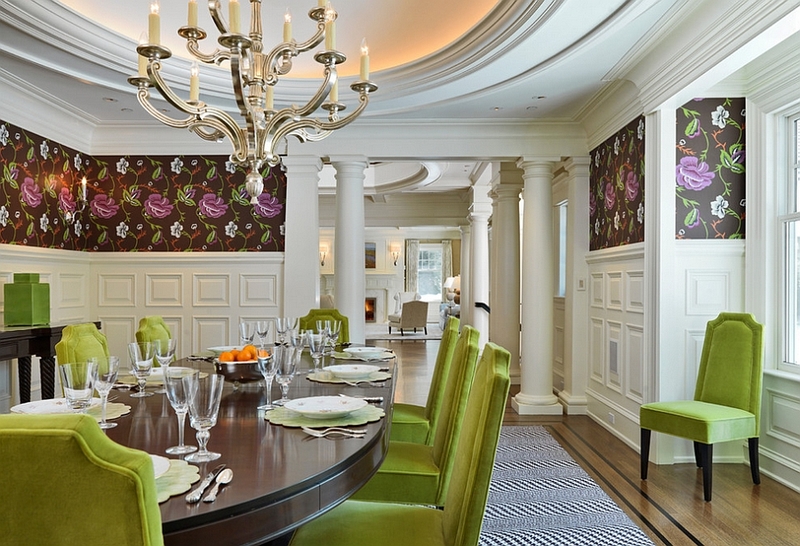 Using green in the dining room is all about knowing what works best for your own home and picking hues that accentuate the existing style and color scheme of the interior. This task does get a touch trickier if you have an open plan living area. 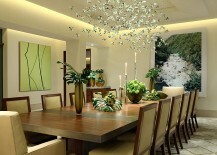 Yet green dining rooms instantly draw your attention while creating a soothing atmosphere. 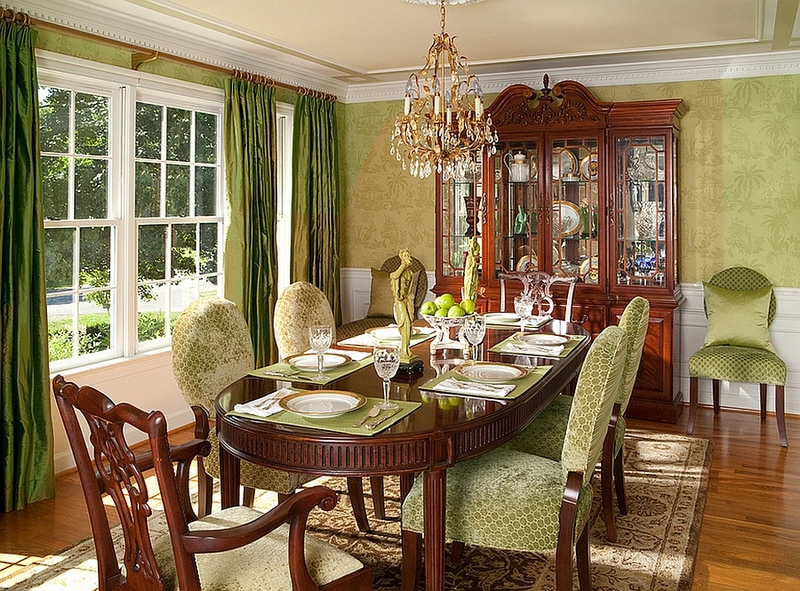 There are many wonderful ways that you can incorporate green into the dining room, and today we have some gorgeous inspirations that showcase how to get it done with flair and functionality! 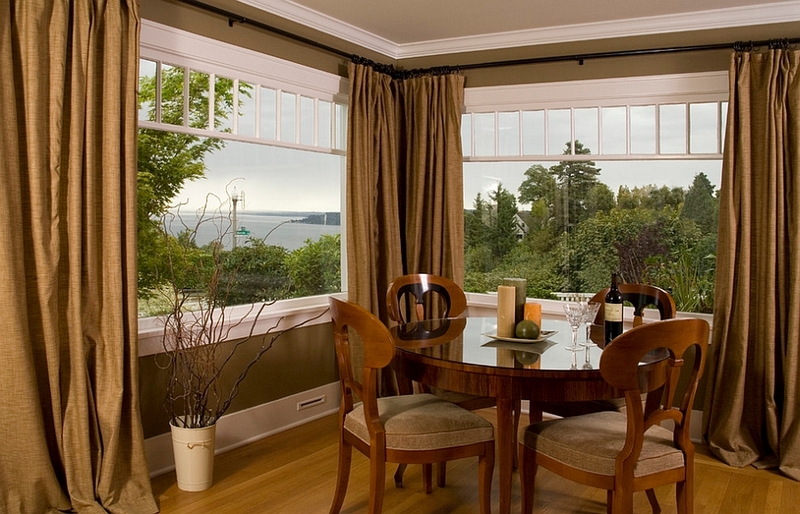 An obvious and easy way to add green to the dining room is by simply starting with the walls, and most homeowners obviously seem to prefer this uncomplicated approach. 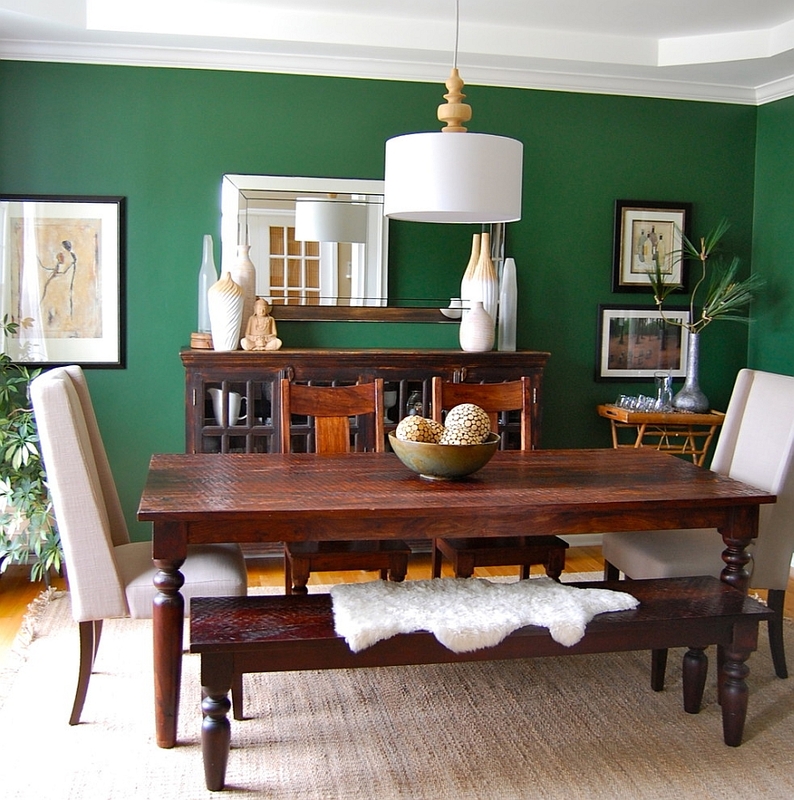 Yet carefully choose the shade of green that you want for the dining room walls, as only a color that you ‘absolutely love’ will work in the long run. An effervescent and vibrant shade of jewel-toned green might look amazing right now, but you could get bored with the look pretty soon. One of the advantages with green is that darker shades of the color seem as beautiful and apt as lighter hues even in small dining spaces. 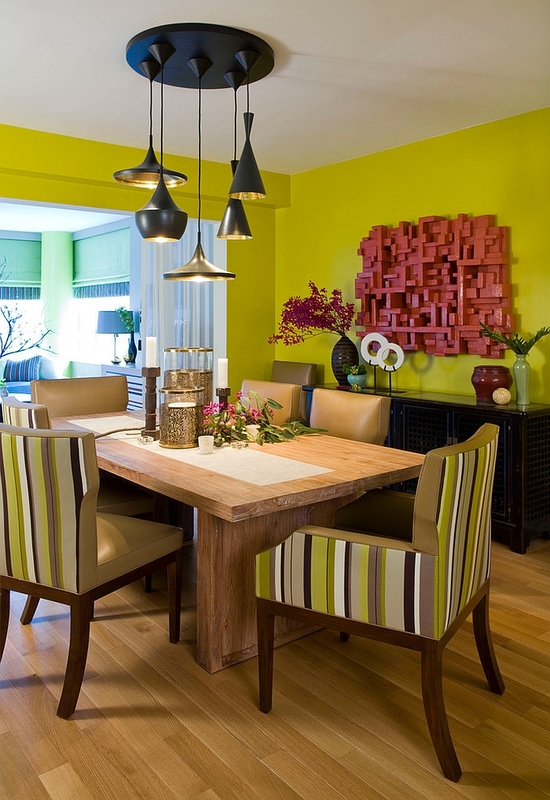 Bright greens such as Chartreuse are currently ‘in’, and they do enliven the dining room and fill it with an air of anticipation. 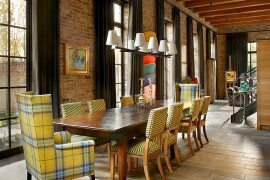 Yet these colors might seem a touch overwhelming when used for the walls. 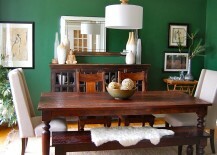 The solution here is to keep the walls neutral and to add such dark, bolder shades of green using area rugs. 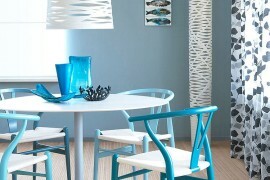 Painting the ceiling is another fun idea for those who wish to go beyond the obvious! 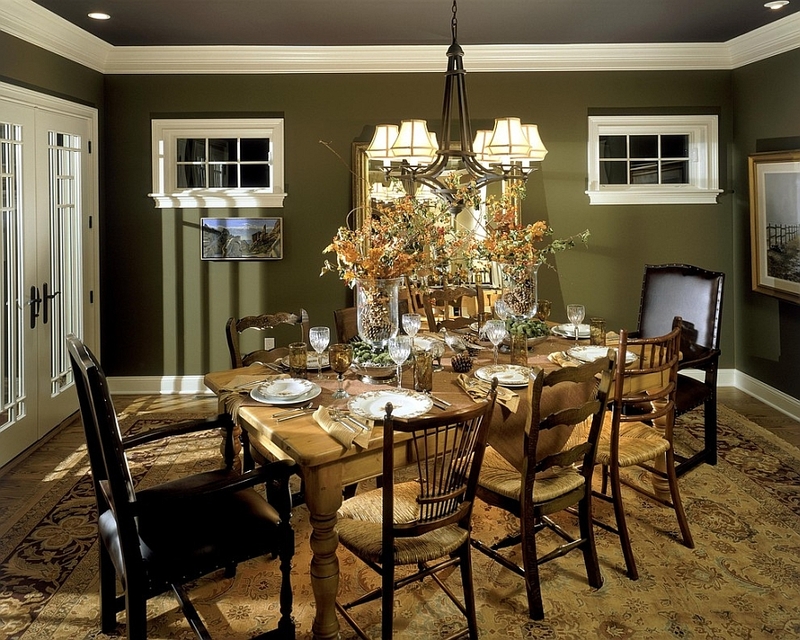 Lighter shades of green for the ceiling coupled with yellow or white walls are perfect if you are trying to shape a farmhouse or a vintage-style dining room. 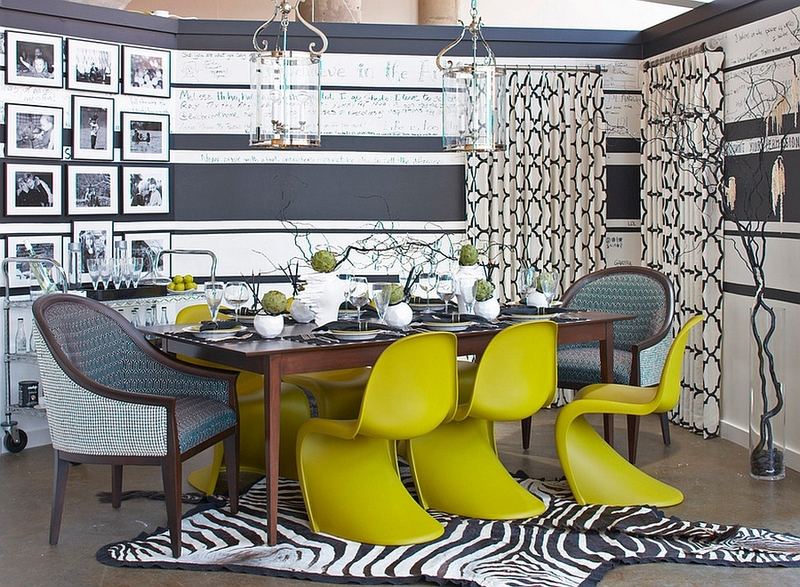 Here is the easiest choice of them all in case you wish to try out green in the dining room without actually committing to it fully. Use bold green accents that stand out visually in the form of a stylish rug, potted plants or even some carefully place green apples on a plate that draw your attention! 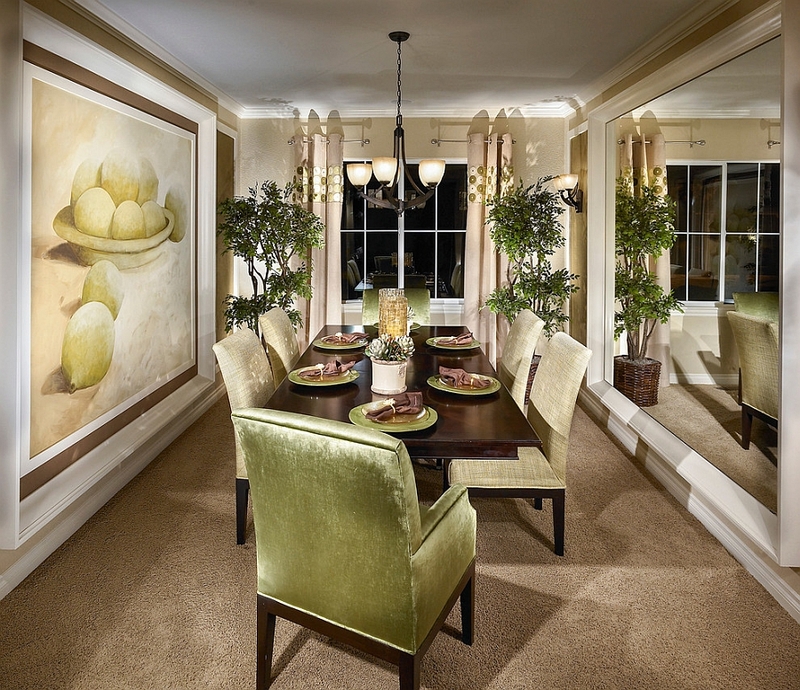 Remember that the more neutral the backdrop, the greater the impact of even the tiniest splash of green in the dining space. 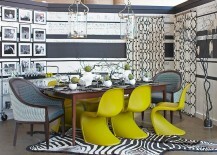 If you happen to have a black and white dining room, this approach to decorating with green is the one that works best. And in case you are not happy with the look, you can always switch out these accents. 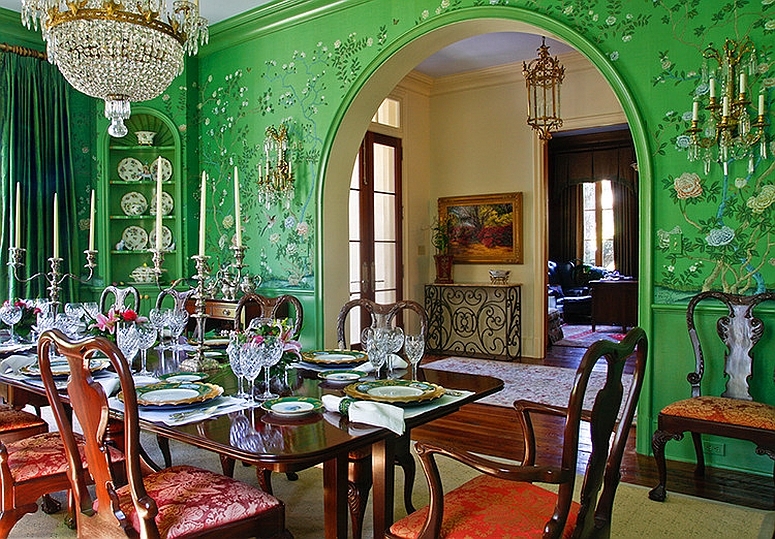 More confident with using green in the dining room? Then bring dining table chairs with gorgeous green charm to truly alter the appeal of the setting. 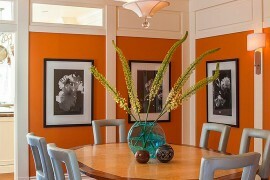 This not only gives you an option of using green without actually repainting the walls, it also lets you use the color along with other bright hues. 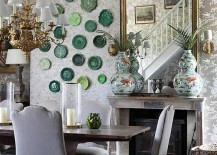 Combine bold green decor finds with delicate drapes in bluish-green for a sophisticated and breezy look! 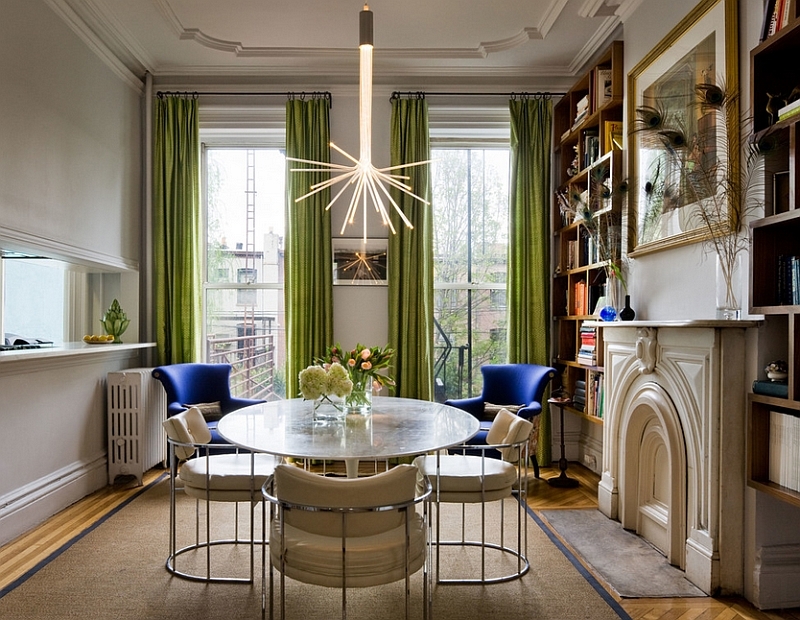 Drapes in darker shades of green are more apt for traditional and rustic dining spaces, and those who want an eclectic look will do well to pick ones with bold, geometric prints. 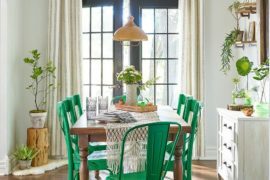 This definitely is our favorite little way of adding green to the dining room, and it truly will bring a ‘breath of fresh air’ indoors. Add a wonderful potted plant or two in the lonely, forgotten dining room corner, and you will quickly fall in love with the look. Tiny herb planters on the dining table also work beautifully, and if you want to add more greenery, then maybe you can even switch to an exotic tropical style indoors. 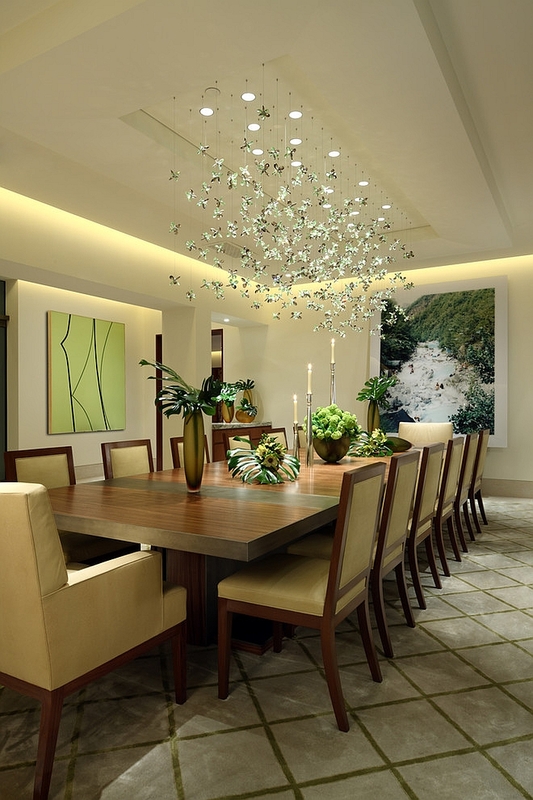 Another way of adding greenery would be to open up the room with glass walls so that the fabulous backyard or natural canopy outside becomes a backdrop for the dining space. Wallpaper and grasscloth wallcoverings not only add color to the room, they also add exciting, fun patterns and another layer of texture. 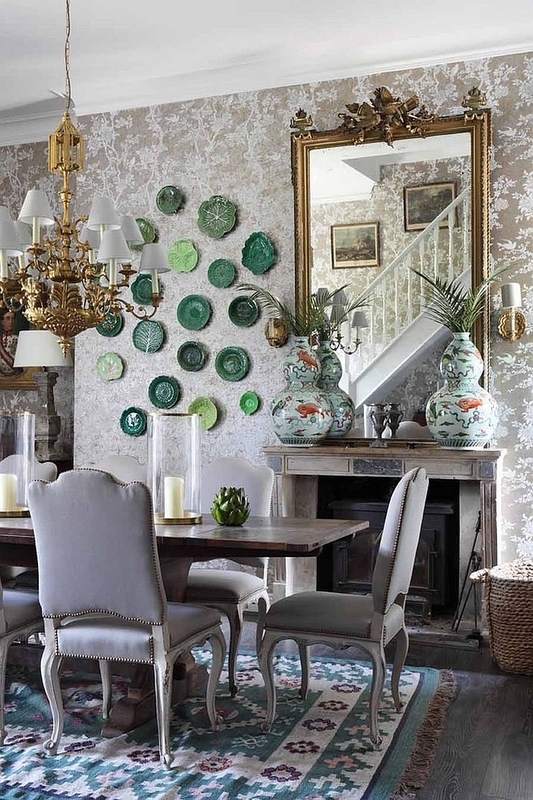 With wallpapers making a comeback of sorts in 2014, this is another hip, cool way to add green to the dining space, and you can start off by wallpapering a little nook before committing to a more extensive project. 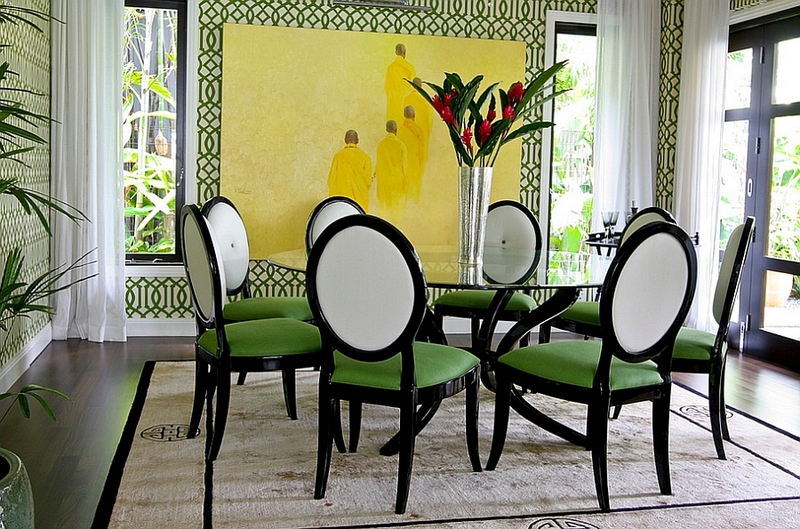 Patterned green wallpaper works best in traditional, midcentury and Mediterranean-style spaces. 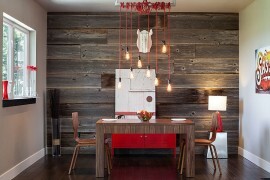 But you can even try it in a restrained fashion in modern settings if you really love the look. 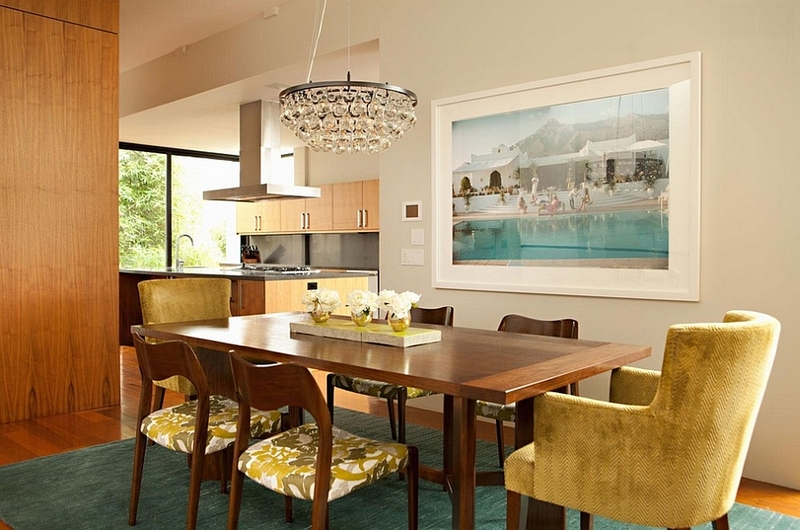 Green works well with other bold colors such as red, yellow and blue, and hence you will have little trouble adding it to your existing dining space. All one needs is a bit of creativity and a love for green!